Chlorophyll gives leaves their green color and absorbs light that is used in photosynthesis. Chlorophyll is a chemical in the chloroplasts of plants. It allows plants to absorb and use light. Energy from the light is used in photosynthesis to make glucose. This contains lots of stored energy which the plant needs to release. It does this through respiration. This energy is then used when the plant grows or repairs damage. Chlorophyll also makes the stem and leaf of the plant green. Chlorophyll is a green pigment in almost all plants, algae, and cyanobacteria. It absorbs light most strongly in the blue portion of the electromagnetic spectrum, followed by the red portion. However, it is a poor absorber of green and near-green portions of the spectrum. Chlorophyll was first isolated in 1817. 1.1 Why green and not black? Chlorophyll is necessary for photosynthesis, which allows plants to obtain energy from light. Chlorophyll molecules are arranged in and around the membranes of chloroplasts. It serves two main functions. 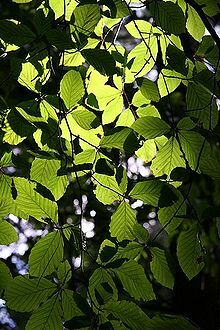 The function of most chlorophyll (up to several hundred molecules per photosystem) is to absorb light and transfer that light energy to reaction centres. These pigments are named after the wavelength (in nanometers) of their red-peak absorption maximum. These chlorophyll pigments can be separated in a simple paper chromatography experiment. The function of the reaction center chlorophyll is to use the energy transferred to it from the other chlorophyll pigments to undergo a specific redox reaction. In this reaction the chlorophyll gives an electron to an electron transport chain. This reaction is how photosynthetic organisms such as plants produce O2 gas, and is the source for practically all the O2 in Earth's atmosphere. Photosystem I typically works in series with Photosystem II. The electron flow produced by the reaction center chlorophyll pigments is used to shuttle H+ ions across the membrane, setting up a chemiosmotic potential used mainly to produce ATP chemical energy; and those electrons ultimately reduce NADP+ to NADPH, a universal reductant used to reduce CO2 into sugars as well as for other biosynthetic reductions. A green sea slug, Elysia chlorotica, has been found to use the chlorophyll it has eaten to perform photosynthesis for itself. This process is known as kleptoplasty, and no other animal has been found to have this ability. It still is unclear exactly why plants have mostly evolved to be green. Green plants reflect mostly green and near-green light rather than absorbing it. Other parts of the system of photosynthesis still allow green plants to use the green light spectrum (e.g. through a light-trapping leaf structure, carotenoids, etc.). Green plants do not use a large part of the visible spectrum as efficiently as possible. A black plant can absorb more radiation, and this could be very useful, notwitstandanding the problems of disposing of this extra heat (e.g. some plants must close their openings, called stoma, on hot days to avoid losing too much water). More precisely, the question becomes why the only light absorbing molecule used for power in plants is green and not simply black. Shil DasSarma, a microbial geneticist at the University of Maryland, has pointed out that species of archaea use another light-absorbing molecule, retinal, to get power from the green spectrum. Some scientists believe that green-light-absorbing archae were once the most common in the earth environment. This could have left open a "niche" for green organisms which would absorb the other wavelengths of sunlight. This is just a possibility, and Berman wrote that scientists are still not convinced of any one explanation. Chlorophyll is a chlorin pigment, which is structurally similar to and produced through the same metabolic pathway as other porphyrin pigments such as haem. At the center of the chlorin ring is a magnesium ion. For the structures depicted in this article, some of the ligands attached to the Mg2+ center are omitted for clarity. The chlorin ring can have several different side chains, usually including a long phytol chain. There are a few different forms that occur naturally, but the most widely distributed form in terrestrial plants is chlorophyll a. The general structure of chlorophyll a was worked out by Hans Fischer in 1940. By 1960, when most of the stereochemistry of chlorophyll a was known, Robert Burns Woodward published a total synthesis of the molecule. In 1967, the last remaining stereochemical elucidation was completed by Ian Fleming, and in 1990 Woodward and co-authors published an updated synthesis. In 2010, a near-infrared-light photosynthetic pigment called chlorophyll f might have been discovered in cyanobacteria and other oxygenic microorganisms that form stromatolites. Chlorophyll Content meters measure the optical absorption of a leaf to estimate its chlorophyll content. Chlorophyll molecules absorb in the blue and red bands, but not the green and infra-red bands. Chlorophyll content meters measure the amount of absorption at the red band to estimate the amount of chlorophyll present in the leaf. To compensate for varying leaf thickness, Chlorophyll Meters also measure absorption at the infrared band which is not significantly affected by chlorophyll. The chlorophyll content of leaves can be non-destructively measured using hand-held, battery-powered meters. The measurements made by these devices are simple, quick and relatively inexpensive. They now have large data storage capacity, averaging and graphical displays. In diethyl ether, chlorophyll a has approximate absorbance maxima of 428 nm and 660 nm, while chlorophyll b has approximate maxima of 453 nm and 642 nm. The absorption peak of chlorophyll a is at 666 nm. In Angiosperms, the last step in the synthesis of chlorophyll is light-dependent. Such plants are pale (etiolated) if grown in the darkness. Non-vascular plants and green algae have an additional light-independent enzyme and grow green in the darkness instead. Chlorosis is a condition in which leaves do not make enough chlorophyll, so they become yellow. Chlorosis can be caused by a not having enough iron--called iron chlorosis—or by not having enough magnesium or nitrogen. Soil pH sometimes affects these kinds of chlorosis. Many plants are adapted to grow in soils with specific pH levels and their ability to absorb nutrients from the soil can depend on this. Chlorosis can also be caused by pathogens including viruses, bacteria and fungal infections, or sap-sucking insects. ↑ Delépine, Marcel (September 1951). "Joseph Pelletier and Joseph Caventou". Journal of Chemical Education 28 (9): 454. doi:10.1021/ed028p454. ISSN 0021-9584. http://pubs.acs.org/doi/abs/10.1021/ed028p454. ↑ Gilpin, Linda (21 March 2001). "Methods for analysis of benthic photosynthetic pigment". School of Life Sciences, Napier University. Retrieved 2010-07-17. ↑ "Why did plants evolve green, not black? (Page 1) - Plants & Fungi - Ask a Biologist Q&A". www.askabiologist.org.uk. ↑ April 10, Ker Than; ET, 2007 06:41am. "Early Earth Was Purple, Study Suggests". Live Science. ↑ Woodward RB, Ayer WA, Beaton JM (July 1960). "The total synthesis of chlorophyll". Journal of the American Chemical Society 82 (14): 3800–3802. doi:10.1021/ja01499a093. http://pubs.acs.org/doi/abs/10.1021/ja01499a093. ↑ Fleming, Ian (14 October 1967). "Absolute configuration and the structure of chlorophyll". Nature 216 (5111): 151–152. doi:10.1038/216151a0. http://www.nature.com/nature/journal/v216/n5111/abs/216151a0.html. ↑ Robert Burns Woodward et al. (1990). "The total synthesis of chlorophyll a" (PDF, 0.5 MB). Tetrahedron 46 (22): 7599–7659. doi:10.1016/0040-4020(90)80003-Z. http://media.iupac.org/publications/pac/1961/pdf/0203x0383.pdf. ↑ McAlpine, Kate. "Infrared chlorophyll could boost solar cells". New Scientist. ↑ Duble, Richard L. "Iron chlorosis in turfgrass". Texas A&M University. Retrieved 2010-07-17. This page was last changed on 5 April 2019, at 17:27.